The Puerto Rico house's features include extensive screening that allows cross breezes but blocks overheating from the sun's rays. This rendering shows the strong connection of the two legs of the L-shaped house to the patio. 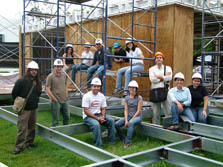 The Puerto Rico team planned its house as a model energy-efficient dwelling for the Caribbean. The L-shaped 2009 entry clearly looks to the outside and responds to the opportunities and challenges of the Caribbean climate. The two legs of the L are connected by an outdoor patio, but only one leg is mechanically conditioned. The other is enclosed largely with special screens that allow occupants to look out and cooling breezes to pass through but block nearly 90% of the sun's rays. The conditioned leg uses those screens as well but also has sliding glass doors that can be closed off when conditions warrant. The University of Puerto Rico is one of only two schools to enter all four Solar Decathlons. The 2009 University of Puerto Rico team is dominated by architecture students—some already graduated. Team member Zoé Galán Comas is one of those architecture specialists. "This project taught me not only how to design a home but also to plan a project and how very important that planning is," she says. For engineering advice, the team turned to the School of Architecture faculty members who specialize in technology, including electrical and mechanical systems, and to faculty members from other departments, who were very supportive throughout. 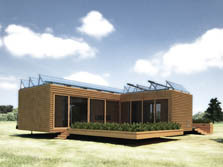 The team bills the house as CASH—Caribbean Affordable Solar House. CASH is designed to maximize aesthetic and natural lighting and the cooling-breeze connection to the Caribbean outdoors. Redwood outside and teak inside—both reclaimed—add to the Caribbean ambience, as does the house's L-shape surrounding a central patio. An L-shaped design that readily divides into two separate pieces for easy shipping and provides for an easier assembly on the National Mall.